I have just awoken from a terrible nightmare. In the nightmare, my car was swept away in a flood and flattened right before my eyes. It felt incredibly real. I am leaving for Manila this morning and I cannot help feeling that it is a bad sign. However, talking nonsense about signs and omens right before my departure was not a smart thing to do. First of all, dreams are mere mirrors that reflect your inner worries and fears, and since I have never lost sleep over any worries or fears, I probably only have nightmares when I am feeling conflicted. Yeah, maybe my subconscious is being influenced by my image of Manila as a city that is a little different from any of the other Asian cities to which I had traveled. In the Philippines, particularly the city of Manila, you might say there are a lot of people with various quirks and idiosyncrasies. One of the major reasons is probably because it is one of the few “gun societies” in Asia. That is why, of all the Asian cities I visited, it is one city where I kept my guard up from minute one. 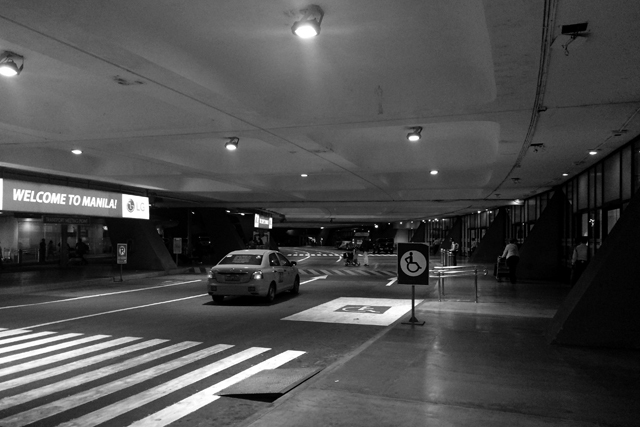 Starting with the point of arrival – the airport is scary. In fact, there are even some people who warn, “You need to be more careful at the airport than in the city.” Others advise, “A Japanese should never be at the Ninoy Aquino Airport alone at night.” However, as long as my travels are quests to find and present Asia’s beautiful sights and interesting places that are less known to the Japanese, it is definitely worth travelling alone to a fascinating city like Manila. It is merely four hours and a half from Narita, yet the Japanese know relatively little about it. When most Japanese think of the Philippines, they think of the resort island of Cebu. I would like to visit the place myself someday. Unfortunately, I cannot see myself going without first learning more about Metro Manila, considered somewhat of an “untouchable” as a tourist destination. Of course I do not have any set rules for my “trips”. Nevertheless, Thailand provided me with a different outlook on travel because it was only after I had familiarized myself with Bangkok that I had a better grasp of places like Ayutthaya and Pattaya. For example, if I were not Japanese, it would be in my best interest to first explore Shibuya and Ueno and experience the smells, strange rules and interactions with living, breathing human beings, before visiting Shirakawa Village, Kyoto or Nara. That is basically the premise for my second visit to Manila this time. “It’ll be ok,” I whisper to myself. I have much more travel experience and smarts compared to three years ago. For example, with only the moon to light my way, I walked for over 30 minutes in the middle of the night from an airport in southern India to my hotel in the countryside. I also wandered around a dangerous part of town in Jakarta looking for a hotel I had reserved not knowing it was located in the center of a slum. Come to think of it, the last time I was visited Manila, I had made a wrong turn out of a restaurant and found myself walking in an area that the travel books warn you to “Never go at night.” As luck should have it, I never felt fearful. 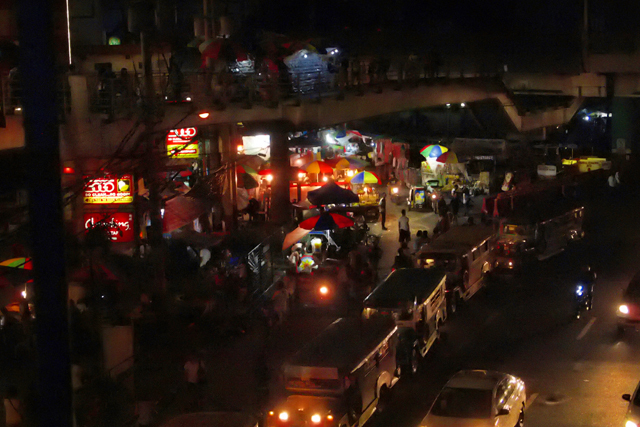 Though it was at night, the downtown markets had children playing and I could see many local women walking around – Nothing to be afraid of. Besides, I have already been to Manila once, so I have gained a rough feel for the place. I have learned how to grab a taxi. I have ridden some pretty dingy elevated railways from some pretty dingy stations. I have grown accustomed to the sight of building security guards with automatic rifles tucked under their armpits. A reasonable amount of caution and some travel experience will greatly reduce the risk of any major trouble. That’s right. So, rationally, there is really nothing to worry about. On the subject of caution, despite having asked myself repeatedly before leaving the house, “Have I forgotten anything?”, the plane has already left Narita and is flying at an altitude which, looking down, makes the Boso Peninsula look like Indian naan, when I realize I have forgotten my “Globe-Trotter Travel Guide Book” on top of the cabinet by the front door. Oh, well. I will just have to rely on my sketchy memory. I narrow my eyes at the offline map on my smartphone and decide to try and enjoy the inconveniences of the trip. “I shall return.” Those are the famous words left behind by Gen. MacArthur when Japan forced American troops to temporarily withdraw during WWII; and just as he had declared, he returned. I wonder what words he propounded that second time? Maybe he had said to himself, “I have returned,” but decided it was not quite right. “I’m home” would have been plain wrong, so maybe, “I’m back”? These are the thoughts I am toying with in my head as I look out the window of the plane at the approaching, worn out-looking Terminal 1 building. My friend was right when he said Ninoy Aquino Airport was “scary”. It sure lives up to its infamy as the “world’s worst international airport”. The airport employees are corrupt, most of the airport taxis are awful, the facilities are ancient, plus a thousand more other reasons, but I won’t list them here. I, of course, still have no idea what MacArthur felt when he had returned to the Philippines when my plane pulls into the apron and the other passengers begin standing up and pulling luggage down from the overhead bins. As I look out at the white lettering of “NINOY AQUINO AIRPORT” that looks as though it could have been taken straight out of a 70’s movie, I feel a strange sense of nostalgia, as though I am returning to a place I had long forgotten. When I first step off the boarding bridge into the airport, I feel a bit uneasy. The place has been so completely remodeled that, for a while, I wonder if I have arrived at a different Terminal 1 than the one I had used last time. Of course, it still carries much of the same old atmosphere. I mean, no matter how much you buff and polish a classic car, it is still a classic car. Or, like Narita’s Terminal 1, no matter how much it is refurbished it, it will never become a Centrair or Handa. Still, the somewhat creepy aura of the Aquino Airport seems to have been recently painted over with a bright coat of paint. I anticipate what is going happen after passing through immigration… no need to reclaim my luggage. So, I just go straight through customs, then head to the arrival gate. I decide to make a pit stop at the bathroom to the left, then keep going toward the taxi service counter that should be just outside and to the left of the exit. I will give the person the name of my hotel. If they do not understand, I will just give them the name of the area where the hotel is located. If they still did not understand, I am 100% sure they will know the name of the famous hotel that was located right next door. …Last time I was here, I arrived at the airport at 10:00 p.m. Today I am arriving after midnight, so I need to be extra careful. There is no need to be fearful of small percentages, but passengers boarding taxis at the airport are robbed at gunpoint every year. “Copakaba?” the attendant replies in a flat tone. At first I am relieved that I do not have to attempt to give him the address, but I am also slightly disappointed that the simulated answers I have been practicing are put to waste. 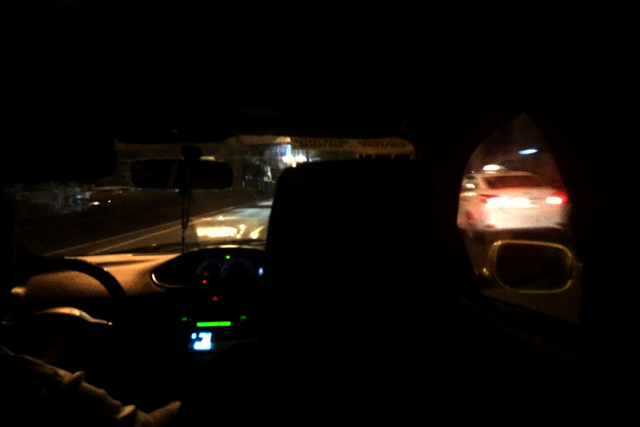 He makes an exerted effort to signal over a crusty-looking taxi and says, “Get in.” He continues in his flat tone to the driver, “Copacabana… Pasai…,” adding two or three other words of Tagalog in-between. It is probably just some superficial conversation. Meanwhile, I open the door of the Corolla taxi, slide my luggage and myself onto the seat and settle in. The driver is a middle-aged man with some girth and big, round eyes, like a Pilipino Louis Armstrong. “Yellow Taxis” are metered taxis that can come and go through the airport, but charge a much higher rate than the regular taxis that you can pick up on the street. Another type of taxi, called a “Coupon Taxi”, charges an even higher rate, but has a fixed-rate service for delivering you to your hotel or tourist destination, so there is no need to negotiate fares. First-time visitors to Manila should probably stick to this kind of taxi. At the airport exit you’ll find these three types of taxis… Actually, there is another non-licensed “white taxi”, so that makes four types total. As you might expect, even the locals are wary of these white taxis. I remember ignoring a number of men trying to lure me toward them while I walked straight to the taxi stand. This time, I hardly saw any of these men, so new regulations must have been set up with the refurbished airport. I immediately lock the door upon getting in the taxi. That is something that is as practical as taking the cap off of a bottle of beer before drinking it. During my previous trip, as soon as the taxi drivers put the gear in drive, they would tell me to “Lock the doors” or would just reach over and lock the doors themselves. We circle out of the airport, then glide into the dark streets. The first traffic light out of the airport always seems to be jammed no matter what time of day it is. Looking at the map, the various terminals all merge there, so it is no wonder the road bottlenecks there. Despite it being so late at night that we are already crossing over into a new day, all kinds of vehicles are making a cacophony of traffic sounds. 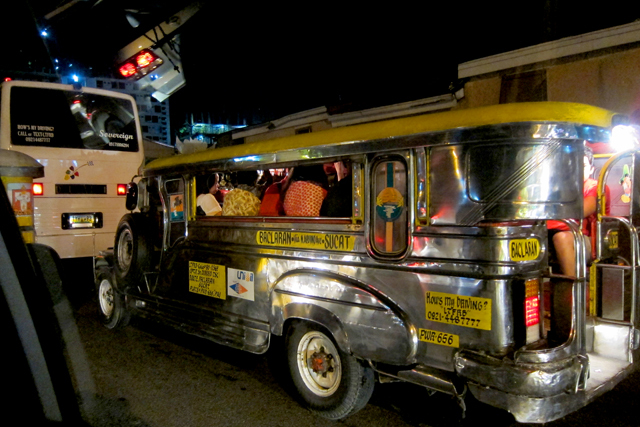 Jeepneys are like local buses that have the face of a jeep with a very long body. They are a symbol of the city. The back of these Jeepneys overflow with passengers. Through the window of my taxi, my eyes sometimes meet those of Jeepney passengers. At one light, there is more than 10 seconds of awkward eye contact, so I look away. After passing several Jeepneys, slow motorcycles and cars, we arrive at and speed through the long and straight Roxas Boulevard. At this rate, it will only take five or ten minutes to reach the hotel. The hotel where I am staying tonight is neither in the relatively safe area called Makati, where most Japanese tourists stay, nor is it in the lively downtown neon districts of Ermita or Malate. It is a standard-class hotel in an area called Pasay, located fairly near the airport. Although I had a little to eat before departing, I did not drink any alcohol on the plane because I had reserved a window seat and wanted to avoid frequent visits to the bathroom. I also knew it would be late at night when I arrived, so I had reserved a hotel close to the airport and was planning to have some beer at a bar or restaurant near the hotel. It is not long before we turn off of Roxas Boulevard and enter the Pasay area. I can see Heritage Hotel on the corner to the right. After we turn, right next door, I can see the homely looking Copacabana Hotel. The hotel is smaller than the Heritage and the taxi pulls up in the driveway that is much smaller, too. The taxi meter reads 170 pesos. It is then I realize that, although I have been able to grab a taxi smoothly enough, I have completely forgotten to get some change at the airport. I do not have any smaller bills, so I hand the driver a 500 peso bill with the intention of giving him a 30 peso tip and asking for 300 pesos in change. A 30 peso tip from a foreigner is adequate, neither too much nor too little. But this was when a problem comes up. The driver is shaking his head and complaining loudly about something. “What?” I ask, but he just begins shouting louder. He is laying out words like, “No!”, “money”, “change”, but his accent is so strong I cannot make out what it is he is trying to say. He does not seem to be saying that does not have enough change. He pulls out some bills from his breast pocket and is saying something, but at the moment all I can do is stare at the expression on his face that is making him look exactly like Louis Armstrong blowing on a trumpet. “This is all of I have in small bills. Please just give me 300 pesos in change. Don’t try haggling any more from me just because I am a foreigner,” is what I was saying as I try handing him the 500 peso bill. He shakes his head, “What am I going to do with this guy?” and morphs back into Louis Armstrong. Now we are haggling. A hotel security guard who has been watching us comes over to the taxi. “What is this guy saying?” I ask the security guard, who turns to speak to the driver in Tagalog, then turns back to me trying to explain what the drivers is saying in English that is worse than the driver’s. I start getting extremely aggravated with this driver who is continuing to berate me. “What’s your problem?! Why are you messing with me? !” I start going off on the driver while pointing at the meter. Man, I have barely arrived, it is late at night, and I am already running into to trouble. All I want to do is have a beer.